This image basically says it all. But honestly, I’d rather have another bout of gastritis than something more serious. This year was really not so bad, universe! Excuse me while I knock on wood. 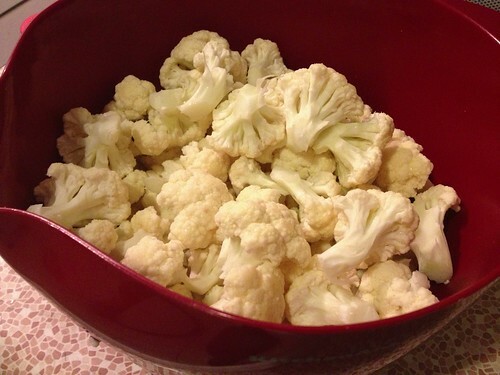 And now let’s talk about cauliflower. And then like two days later I fell and sprained my ankle, so it’s good I got my cooking in. I was pumped about this recipe because I already owned all the spices I needed. 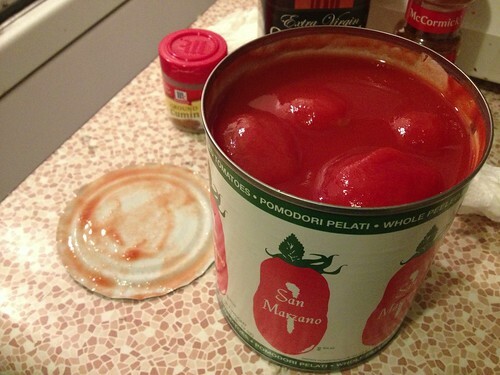 And I was excited to use San Marzano tomatoes, which come in such cool cans. I also bought a bucket of tricolor couscous for the occasion, because I like tricolor everything. My closest grocery (Albertson’s) doesn’t sell pre-chopped onions, so that was my SECOND chopped onion of the day. I chop them under cold water, with more emphasis on FAST than technique. There’s something very satisfying about breaking a head of cauliflower down into florets. Somehow it didn’t really compute in my mind that all that crap wouldn’t fit super easily into my biggest pan. 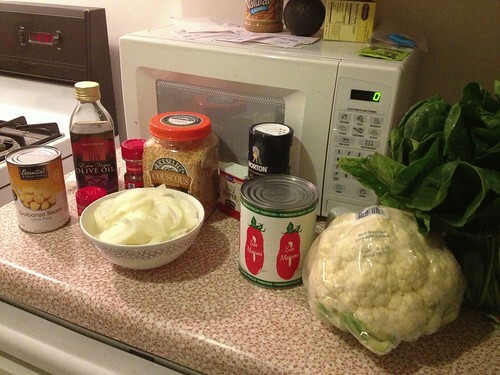 I was just like… oh, everything will reduce when it cooks. Vegetable shrinkage. Really, the first mishap was the crushing of the tomatoes. My mom has this classic story about how she went on a date, a fork was stuck into a tomato, and wardrobe stain-age ensued. But for some reason, I squeezed into these whole, peeled tomatoes without a clue as to what might ensue. At that point I was like — I cannot bring this to a boil. It will explode. So I called upon my new soup-making pot, which had been sitting unused for a while. And a great migration began. While that boiled, I rinsed and chopped some farmers’ market spinach, hoping it was approximately 5 ounces. And vegetable shrinkage eventually did occur! The spinach got added in the last two minutes. I have pictures of it, but it’s spinach. You know the drill. 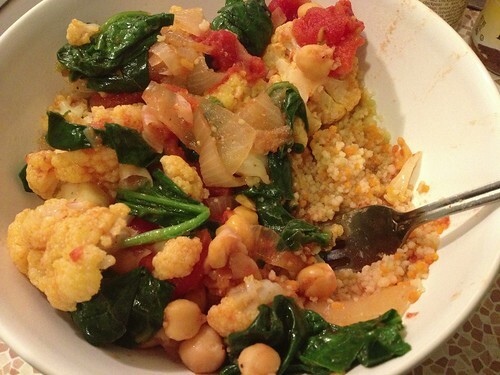 I was also excited about this recipe because it utilized that really simple couscous cooking technique of just adding a bit of hot water and letting it sit. It’s a handy technique if you’re going to serve the couscous with a hot stew or something liquid-y — because the couscous doesn’t cook 100% until you add said hot liquid thing to it. If you just want plain couscous — boil it with some olive oil, or whatever the instructions are. Trust me. Or you will be eating hard couscous. I was like — wow, I have a crapload of “meh” food, mostly vegan. All in a day’s work! But I think in the transfer, I may have lost some of the spices (maybe they were sticking to the pan)? 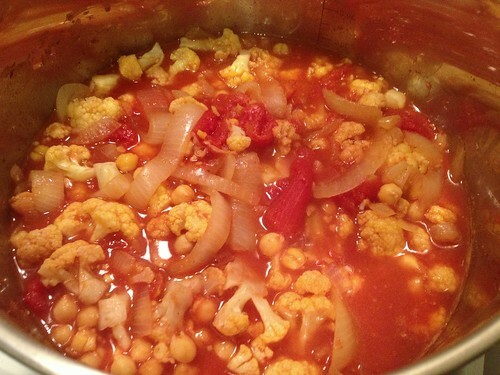 And, a few weeks later, I am weirdly craving this stew like no other. So… I guess it was kind of a hit, with my stomach. I’ll probably cook it again soon. Next time I’ll know to start it off in the big pot. 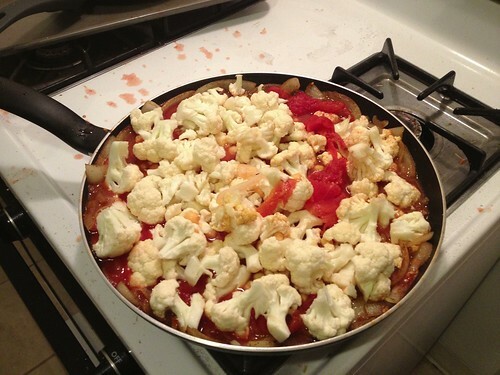 And I’ll probably buy pre-cut, pre-washed cauliflower and spinach… out of laziness, I guess. 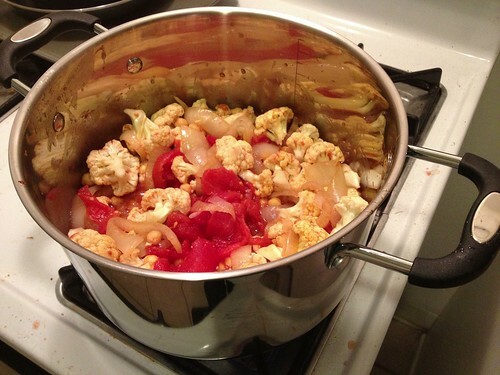 And I’ll hold the tomatoes way down into the pot when I squeeze them, to minimize the mess. This concludes my trilogy of mishaps… until next time. Because these things always happen in threes, right? That tomato story was not from my date. Luckily, I was not involved at all. Barry went out on a first (dinner) date with a very pretty girl. She was wearing all white. He went to cut a cherry tomato in half with his fork and it kind of exploded. Tomato juice went flying all over her face and outfit.. She was furious. Humiliation ensued. It was his first AND last date with her.